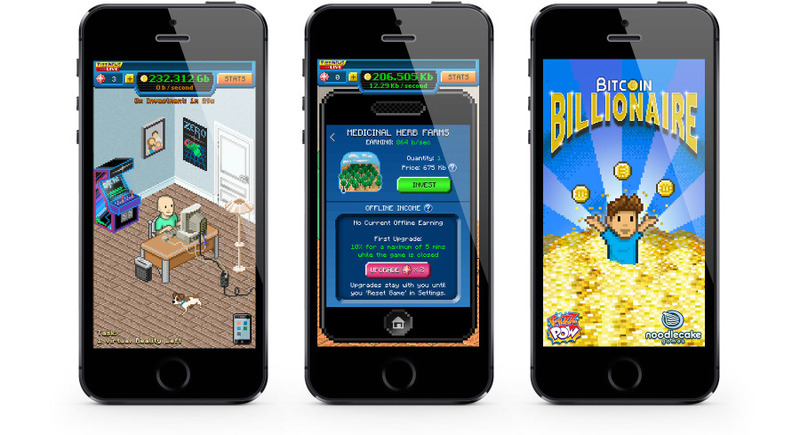 Bitcoin Billionaire is a newly-released casual game about mining Bitcoins, the virtual currency. It’s developed by Noodlecake Studios, who made Super Stickman Golf, a very solid game released in 2011 that received a design award from Apple. Last week a new episode of South Park titled Freemium Isn’t Free aired which hilariously pokes fun at free to play mobile games. The joke is that free to play games are dumb and simple waiting games, and of the most well-known freemium games in particular, this is very accurate. Bitcoin Billionaire is a perfect example of the situation described in South Park. But a less funny truth omitted from the South Park episode is that sometimes games can be completely mindless and still lots of fun. Bitcoin Billionaire is one of those. In terms of unique and interesting gameplay, it is a barren wasteland. That’s it. There is no cooperating with other players, nor real strategy involved. Tap, upgrade, and then keep tapping and keep upgrading. The game only requires persistence, to keep tapping and keep upgrading. At no stage of the game do anything but numerical values and pixel-art interior design objects change. One of the chief criticisms of the freemium business model is that it’s difficult to find enjoyment when everything is behind a paywall. Bitcoin Billionaire smartly allows players to be passively as well as actively monetized, reducing the pressure on players to spend actual money. As is now common knowledge, it’s normal for 98% of players in a freemium game to never spend money. Revenue is accrued from the 2% of paying players, a small percentage of which will be high-spending players who will usually make up the lion’s share of the revenue in a typical freemium game. What Bitcoin Billionaire does with optional video ads and banners is attempt to monetize the other 98%. They cleverly make these completely optional, which I suspect makes players much more likely to endure, and in many cases, even choose to watch all of them and collect the speed-up benefits. Currently, not even a week after release, Bitcoin Billionaire is ranking within the top 200 grossing apps in over 15 countries. This game has good reviews, tons of downloads due to a feature by Apple, and is monetizing well. It’s important to note that the ad revenue which this game collects is not factored into the top grossing chart figure, so the actual take is even higher than the chart position indicates. There’s no skill to hone in this game aside from persistence, so what makes it fun? Its weakness is the same thing that makes it fun: it’s ridiculous. I rode the subway yesterday and tapped the screen on my phone furiously with two hands for about three minutes while someone across from me just stared. I had just unlocked the downtown apartment and got the aquarium and fast computer upgrades, all of which are pixel art visual details which change nothing in the game. Is this game dumb? Oh, absolutely. This game knows exactly what it is, and it unfolds with a keen awareness. In many ways I feel that Bitcoin Billionaire highlights what’s really unique about mobile games. This would never work on another platform. The act of performing mindless and repetitive activity at various points throughout your day only to collect fake Bitcoins is appalling, even in the context of mobile games. But in this case, even this vain and purposeless task isn’t without some charm.